Restaurants and bars face a range of security challenges on a daily basis. A constantly changing customer base and high employee turnover leave bars and restaurants at particular risk of theft. A properly installed bar or restaurant video surveillance system can improve safety and security for customers, employees, and business owners alike. From employee theft to dine-and-dash incidents, our surveillance solutions hone in on all activity in your restaurant and bars so you can see what’s going on at all times, even while away from your restaurant on a mobile device. Our surveillance system designers are well versed in restaurant and bar surveillance requirements and system implementation. We offer consulting, camera placements, system design, and integration services. 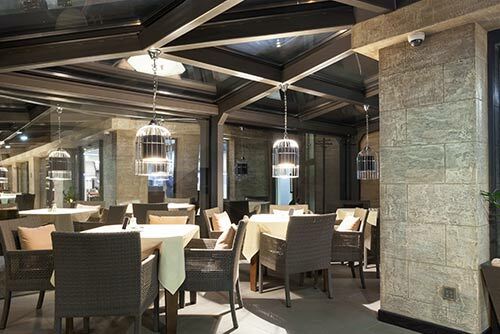 Rapid Installation: Service venues like restaurants and bars often operate 7 days a week. Our video surveillance systems are designed to be rapidly installed and set up, helping you minimized any downtime or inconveniences. Theft Prevention: A properly designed video surveillance can help prevent theft. A restaurant security camera in the right location can put an end to "dine and dash", where customers eat but leave the premises before their bill arrives. Lower Violence: Fights are not unprecedented in crowded bars, especially in charged environments like during sports games or on weekend nights. Our security surveillance cameras can help prevent them and in the event of violence, help to identify the responsible parties. Remote Access: An IP camera network with an NVR (network video recorder) can send footage over the Internet, allowing you to check up on your restaurant or bar at any time. This is perfect if you have a chain restaurant as you can check up on multiple locations without having to be in multiple places at once. Copyright © Code Red Systems All Rights Reserved. Designated trademarks and brands are the property of their respective owners.